These days it feels like we’re inundated with productivity apps, techniques, and services to help us run as well-oiled machines of efficiency. But what does productivity really mean? The traditional definition of productivity is how much you can produce, with the presumed goal of producing more. But for many people, productivity is highly personal and emotional. What are your goals? How do you want to live your life? How can you make your days better, easier, and less stressful? We rounded up a list of our top 10 favorite productivity apps. These apps will not only help you work faster and more efficiently; they’ll also minimize all sorts of pain you weren’t even aware you had during your day-to-day routine. monday.com: Our own productivity app is our work tool of choice, needless to say. 🙂 We use it to manage all of our work: daily task management, project planning, brainstorming, communication, file sharing, and more. You name it, we use monday for it—we have 670 boards altogether (and counting!). One of the biggest advantages of monday.com is that it’s totally visual. You can map out your own workflow and in a single glance, see exactly where things stand—what’s done, what’s stuck, and who’s working on what. For us, monday.com is way more than a productivity app; it has completely replaced email and reduced the overall number of meetings we have. Forest: Smartphone addiction is real. Whether you’re at work, studying, at dinner with friends, spending time with your kids, or driving (! ), the compulsive need to check your phone can destroy your focus—not to mention your quality of life. Forest promises to help you “stay focused, be present” with a simple game: open your app and plant a tree. The tree will grow as long as you don’t touch your phone. (One tree takes 30 minutes.) If you leave the app, your tree dies. Over time you can build a forest, with each tree representing your commitment to unplugging and staying present. 1Password: This app is a simple way to save your passwords and log in to all your sites with a single click. It’s essentially a secure online vault that remembers everything for you—even your bank account routing number or your alarm code. Convenience is one benefit—no need to wrack your brain or shuffle around for post-its around your desk—but security is arguably a way more important benefit of 1Password. Storing your passwords somewhere secure and encrypted protects you from hackers and bad guys. AnyList: Grocery shopping, like laundry, is Sisyphean: unavoidable, tedious, and endless. AnyList makes it less of a burden. Create and share your grocery list with your spouse or roommates, and stay in sync any time someone passes by the store to pick something up. You can even collect and organize recipes and easily add ingredients from your recipes to your shopping list with a tap. If meal planning is your thing, you can use the calendar to organize your cooking and shopping. This is particularly awesome if you have a lot of mouths to feed and limited brain space. Unf*** Your Habitat: “Terrifying motivation for lazy people with messy homes.” Not for people averse to profanity, Unf*** Your Habitat (UfYH) motivates you to clean, tidy, and pick up a few minutes at a time…by yelling and swearing at you. StepBet: We all know that a sedentary lifestyle is bad, but it can be hard to find the motivation and time to work out. StepBet puts a different spin on it: join a group and bet on yourself (typically $40) to walk a certain number of steps, five days a week, for six weeks. The app syncs with your FitBit, Apple Watch, or the Health data on your iPhone. If you don’t meet your goal even once, you fall out of the running and lose your money. Everyone who does reach their goal splits the pot. Will you get rich? No. Will it motivate you to start walking regularly? Yes. Pocket: When you find something you want to view later, just use Pocket to save it directly from your browser, email, or social media apps. Pocket stores all your articles, videos, and images for when you’re ready, and awesomely, you don’t need an internet connection to access them from any device. Pocket has more than 22 million registered users and integrates with more than 1500 apps. If you’re someone who loves a catchy headline but needs to stay focused, Pocket will help you delay your gratification, at least for a little while. Workflow: How many taps does it take to tweet the song you’re listening to? Get directions to the nearest coffee shop? Check the news? Answer: too many. Enter Workflow, which promises to help you “spend less taps, get more done.” Workflow allows you to combine a bunch of steps across all your apps into a single shortcut. Want to tell your partner what time you will be home? You can build a custom workflow to look up your current location, query Google Maps for your driving directions, and compose a text message telling your partner where you are and when you’ll be home—all with just one tap. It’s totally customizable, so you can build any workflow you want. Pretty cool! Tricount: They say friendship and money don’t mix. Make your life easier and avoid awkwardness with this cost-splitting app that helps you calculate costs, split expenses, and settle your debts. Better yet, it works offline. Tricount is great for traveling, roommates, group gifts, parties—any scenario where multiple people are chipping in and need to split expenses. Just access your balance with one simple link, and anyone in the group can add their own expenses and see the balance. Genius Scan: Turn your phone’s camera into a high-quality scanner. This app allows you to quickly scan your documents on-the-go and export them as a JPEG or PDF. It’s really as simple as snapping a photo. Take that huge pile of receipts and finally archive them digitally to Dropbox. If you’re traveling for work, don’t worry about losing track of an expense. Have your employees on the road send contracts and sales agreements immediately upon signature. It’s awesome. RunPee: Alfred Hitchcock once supposedly said, “The length of a film should be directly related to the endurance of the human bladder.” Well, many movies now clock close to three hours, which leaves people with little choice but to duck out in the middle for a quick bathroom break. RunPee has an ingenious solution: it provides a list of carefully selected “pee times” for each movie in theaters. It’s constantly updated the day movies are released into theaters and tells you about 3-5 minute scenes that don’t have crucial plot twists or exciting action. Dark Sky: This app uses state-of-the-art technology to predict when it will rain or snow, down to the exact minute, at your exact location. They’re called “hyperlocal forecasts” and they’re very cool. Is the sky looking ominous? Can you run home before you get drenched? Dark Sky takes out the guesswork. Dark Sky also can send you precise down-to-the-minute notifications before it starts raining or if there’s more severe weather such as thunderstorms or flooding. The only bummer? It’s only available in the US, UK, and Ireland. Oak: There are a lot of good meditation apps out there, but we’re big fans of the recently launched Oak. 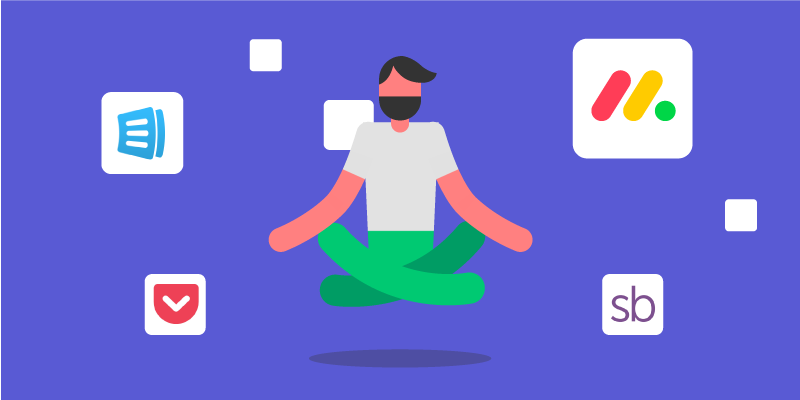 Created by Digg founder and True Ventures partner Kevin Rose, it offers quick and simple breathing exercises as well as longer guided and DIY meditations. How is this a productivity app? There’s tons (tons!) of research on the many benefits of meditation. It can improve focus and memory, boost your energy, slow down aging, and enhance your creativity. What do you think of our recommendation? Do you agree or disagree? What did we miss? We’d love to hear your recommendations!